ChiliCoupon is an old application which was used to terrorize unsuspecting users back in 2011-2012. Even though the application is no longer supported by its developers and even the official website (chilicoupon.com) has been disabled, it appears that its installer is still active, and you may download it by accident. Even though it is unlikely that the program will work the same way that it should, we still recommend having it deleted. ChiliCoupon removal is something we can assist you with. Even though the official download page representing ChiliCoupon is no longer active, it is believed that the program may be attached to outdated software bundles. In the past, ChiliCoupon was used to collect user information and employ it for the creation of different advertisements. Needless to say, you should delete any ads and pop-ups represented by unfamiliar or unreliable programs; however, it is unlikely that they will show up with the current version of the app. This does not mean that you do not need to remove adware. The application originally published by ChiliAds LTD is set to come bundled with tracking cookies which collect information. Most users do not remove cookies thinking that they are eliminated together with adware. Unfortunately, this is not a given. Nonetheless, these tracking cookies are the reason you should consider ChiliCoupon removal. If you do not delete the HTTP cookies, they could record and share data (most likely non-personally identifiable) about your activity and your system. 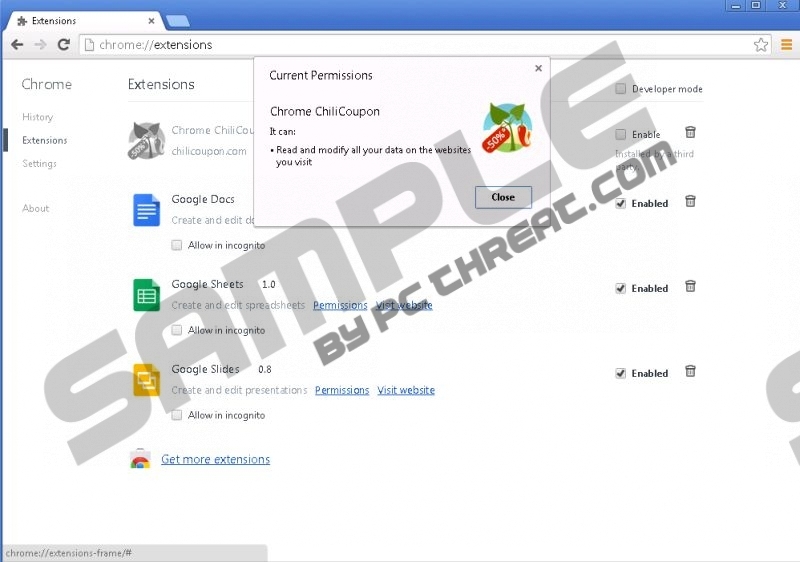 In fact, even in the Chrome permissions section it is revealed that ChiliCoupon could read and modify your data on the websites you visit. This statement is extremely disturbing. Even though it is unlikely that ChiliCoupon ads will show up, you certainly have to avoid them if they do. Do not click them or try to close them because any kind of interaction could route you to third-party sites. The only thing you should do in this situation is delete ChiliCoupon. Needless to say, you should remove the application even if you witness no activity related to the program at all. Whether you want to delete ChiliCoupon related tracking cookies, eliminate displayed ads or remove a program which is taking up space for no good reason, you can follow the removal guides below. Additionally, you should think about installing security software which could block the installation of unreliable and worthless programs in the future. Note that this software should remove ChiliCoupon automatically as well. Move to the Task Bar, click Start and select Control Panel. Double-click Add or Remove Programs to find the list including ChiliCoupon. Select and click Remove to eliminate the undesirable program. Move to the Task Bar, click the Start/Windows button and select Control Panel. Click Uninstall a program and then locate the program you wish to delete. Access the Metro UI screen, right-click and select All apps (Apps menu). Open the Control Panel and in the menu click Uninstall a program. Choose the program that you wish to delete, right-click it and select Uninstall. Quick & tested solution for ChiliCoupon removal.